The race around the world continued for EMS Race Team at the New Zealand Ferrari Challenge. Over the last 12 months, EMS Race Team has competed in eight different countries. On April 12-15, driver James Weiland and the Boardwalk Ferrari crew added New Zealand to a list that already included the United States, Canada, Hungary, France, England, Italy and Australia. 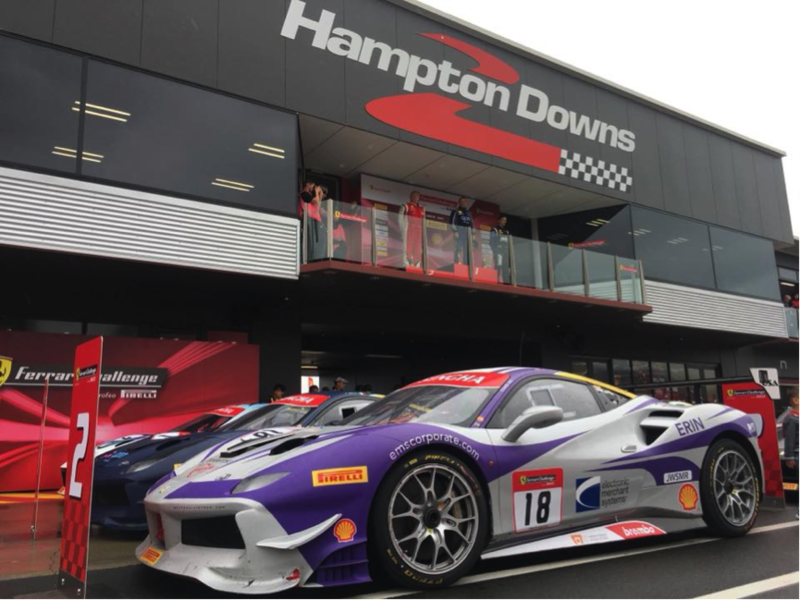 Racing at the Hampton Downs in New Zealand’s largest city, Auckland, Weiland would guide ERIN the ems+ Ferrari 488 Challenge to EMS Race Team’s fourth podium of the 2018 season with a second-place overall finish in Race 1. After earning that second-place overall finish in the Trofeo Pirelli class in Race 1, Weiland and ERIN followed that up with a top-five overall performance in Race 2 to close out the weekend. EMS qualified third for Race 1 and fourth for Race 2 before finishing P2 and P5, respectively. This came during a wet weekend in Auckland that saw both races go off on the same day with only a short break in between. People for the Ethical Treatment of Animals (PETA) is the largest animal rights organization in the world, with more than three million members and supporters. Products proudly displaying the bunny logo are cruelty-free, meaning that they were produced without testing on animals. Coach Sam’s Inner Circle Foundation’s mission is to provide educational support to at risk children through a combination of literacy, personal development and health and fitness programs designed to develop the whole child. Cornerstone of Hope, meanwhile, is dedicated to providing support, education, and hope for the grieving. Guided by Christian values of compassion and service, they welcome and serve all seeking support. EMS Race Team has proudly raced to raise awareness for each cause as they’ve crisscrossed the globe over the past year. For behind-the-scenes coverage throughout race weekend in New Zealand visit EMS Race Team on Facebook, Instagram and Twitter. You can also find more pictures of EMS Race Team’s new mascot, Duffy, along with shots of ERIN during her trip to Hampton Downs. 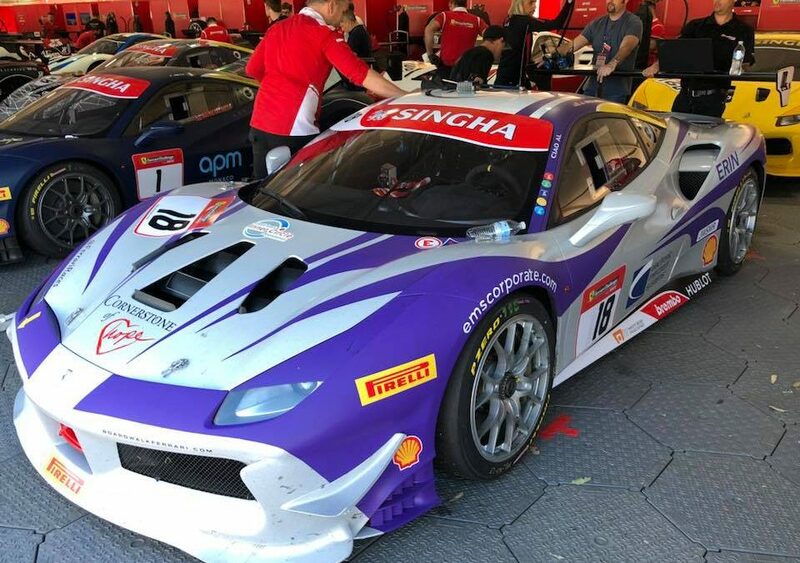 Riding the momentum of a second-place overall finish in the Trofeo Pirelli pro class during F1 weekend in Australia last month, EMS Race Team is now preparing to compete in New Zealand for the next round of the Ferrari Challenge on April 12-15. This trip marks the first time that driver James Weiland and ERIN the ems+ Ferrari 488 Challenge will ever race in New Zealand. Hampton Downs Motorsport Park will be hosting the action during a weekend that expects to be jam-packed with racing excitement out on the track. Hampton Downs Motorsport Park is located in northern Waikato, New Zealand near Auckland and Hamilton. As New Zealand’s most modern motorsport complex, it boasts three different track configurations along with two skidpad areas, one for driver training, the other for drifting as well as an SUV course and go-kart track. On October 18, 2009, Hampton Downs Motorsport Park was open for business and the first competition was held in January 2010. Today, after significant enhancements ever since, Hampton Downs is considered one of the most technically advanced race circuits in the world. People for the Ethical Treatment of Animals (PETA) is the largest animal rights organization in the world, with more than three million members and supporters. Products proudly displaying the bunny logo are cruelty-free, meaning that they were produced without testing on animals. Coach Sam’s Inner Circle Foundation’s mission is to provide educational support to at risk children through a combination of literacy, personal development and health and fitness programs designed to develop the whole child. Cornerstone of Hope, meanwhile, is dedicated to providing support, education, and hope for the grieving. Guided by Christian values of compassion and service, they welcome and serve all seeking support. For behind-the-scenes coverage throughout race weekend in New Zealand visit EMS Race Team on Facebook, Instagram and Twitter.